All the Tidal talk had me revisiting one of my favorite artists, only to realize Garth Brooks does not have a single song available for streaming or download—except a couple of duets. He’s not on Spotify. He’s not on Google Music. In fact, the only way you can get Garth Brooks online is through his terrible online music store: GhostTunes. Launched in 2014 and apparently rarely touched since, it’s a lot of garbage, some Prince, and Garth. Also, because Garth time doesn’t move like real people time, there is no streaming—just buying songs like a 2007 iTunes reject. This sort of makes sense in the rural areas, where many Garth Brooks fans reside. You don’t always have a signal, but when you do, you want to load up on sweet tunes to carry you to the next lonely town that contains nothing but a gas station, a Wal-Mart, and maybe a Storm’s Drive In Dairy Queen. Except, Garth, we live in 2016. People can download their streaming playlists and have all the music they want for $10 a month. Why the hell should they pay you piecemeal? I’d rather pay to fly to Texas and raid my mom’s CD collection and rip the songs. 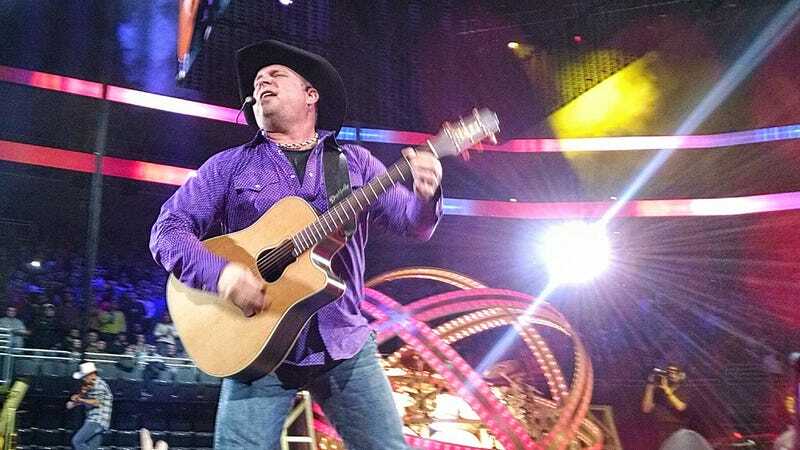 You can still get your Garth Brooks on via Youtube—where many of his songs are attached to fan videos, including the gem. Garth, bubby, we all forgive you for that time you tried to be a rock star and changed your name. We promise to not make fun of you online for at least twenty minutes. Can we now at least have “Friends in Low Places” on Tidal?